Hypocalcemia (HC), without an underlying myocardial disease, is a relatively uncommon but reversible cause of congestive heart failure. We studied the cardiac functions (heart rate, blood pressure, ECG and Echocardiographic parameters (Fractional shortening (FR), left ventricular end diastolic diameter (LVEDD) of 14 children who presented with hypocalcaemia due to VDD before and 2 -4 weeks after treatment with an IM dose of vitamin D3 (VD) (10,000 IU/kg).Correction of HC and VDD was associated with marked improvement of the LVEDDSDS (3.2 +/- 4.4 to 1.1 +/- 2.8) and slowing of the heart rate (from 101 +/- 34 to 94.7 +/- 30/min). The FS and QTc did not change. 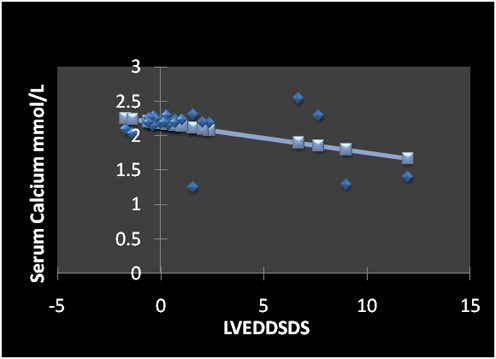 The LVEDDSDS was negatively correlated with serum calcium level (r =-0.46, p = 0.03) and PTH concentrations (r = 0.44, p = 0.032) but not with 25OHD level (r= -0.2, p = 0.2). Improvement of the recorded changes in the heart rate and LVEDD after VD therapy implements an important role of VD through its effect on the concentration of the extracellular calcium ion that could modify the strength of the myocardial contraction through excitation-contraction coupling. These data strongly indicate that the maintenance of an optimal vitamin D status may be a promising approach for the prevention and/or therapy of myocardial diseases and in countries with high prevalence of VDD, vitamin D supplementation can prevent this risk of cardiac dysfunction. Vitamin D deficiency is highly prevalent in the Arab Gulf area and worldwide. Limited cutaneous synthesis due to inadequate sun exposure or pigmented skin and inadequate dietary intake are the principal causes of low 25-OH D levels [1,2]. Vitamin D is essential for musculoskeletal health as it promotes calcium absorption from the bowel, empowers mineralization of newly formed osteoid tissue in bone and plays an important role in muscle function [3,4]. The main manifestation of vitamin D deficiency (VDD) is osteomalacia in adults and rickets in children. Both are generally associated with a serum 25 hydroxyvitamin D (25OHD) concentration of less than 20 nmol/L . In addition, VDD may present with pain in weight bearing joints, difficulty walking and/or climbing stairs, muscle cramps and/or facial twitches and/or carpopedal spasms. Biochemical serum abnormalities included high Alkaline phosphatase, low phosphate and low Ca. Variable radiological manifestations due to VDD can be detected in all children and adolescents [6,7]. In addition, a mounting bulk of evidence suggests that VDD may adversely affect the cardiovascular system . Epidemiologic studies have reported a trend toward higher prevalence of ischemic heart disease and hypertension with increasing distance from the equator, and these higher rates are attributed to the higher rates of vitamin D deficiency in regions with less exposure to sunlight . Clinical studies support a role for vitamin D in maintaining cardiovascular health through both the direct action of the vitamin on cardiomyocytes and the indirectn actions on circulating hormones and calcium levels . Vitamin D receptors have a broad tissue distribution that includes vascular smooth muscle, endothelium and cardiomyocytes . In vitro, activated 1,25-dihydroxyvitamin D (1,25-OH D) directly suppresses renin gene expression regulates the growth and proliferation of vascular smooth muscle cells and cardiomyocytes . Studies in knockout mice confirm that the absence of vitamin D receptor activation leads to tonic upregulation of the renin-angiotensin system, with the development of hypertension and left ventricular hypertrophy . Moreover, hypocalcemia is a late complication of severe VDD in children and adolescents. Hypocalcemia, even without an underlying myocardial disease, is a relatively uncommon but reversible cause of congestive heart failure . Many cases of congestive heart failure and cardiomyopathy associated with VDD have been reported [14-16]. A 14-week course of supplemental vitamin D and CaCO₃ led to healthy 25(OH)D levels in African Americans with heart failure having vitamin D deficiency of moderate-to-marked severity suggested a beneficial effect on ventricular function through attenuation of the accompanying secondary hyperparathyroidism and oxidative stress . The objective of this study was to measure the cardiac functions (heart rate, blood pressure, ECG (especially QT) and Echocardiographic parameters (Fractional shortening (FS), left ventricular end diastolic diameter (LVEDD) of children who presented with hypocalcaemia due to VDD before and 2 -4 weeks after treatment with an IM dose of vitamin D 3 (VD) (10,000 IU/kg). We studied the biochemical data [serum calcium, phosphorus, alakaline phosphatase, 25OHD and parathormone levels (PTH)} and cardiac functions (heart rate, blood pressure, ECG and Echocardiographic parameters (Fractional shortening (FS), left ventricular end diastolic diameter (LVEDD) of 14 children who presented with hypocalcaemia due to VDD before and 2 -4 weeks after treatment with an IM dose of vitamin D 3 (VD) (10,000 IU/kg). Paired student t-test was used to compare variables before versus after vitamin D therapy. The possible relation between cardiac functions and biochemical data were investigated using linear regression equation. Serum Calcium and 25OHD levels increased significantly after 2-4 weeks of treatment with vitamin D. Serum PTH levels decreased significantly after treatment. Heart rate decreased significantly after treatment but no significant change was detected in the blood pressure of patients (systolic and diastolic). LVEDD and LVEDDSDS decreased significantly after correction of VDD. There was no significant change in the FS before versus after treatment (Table 1). *= P < 0.05 after versus before vitamin D therapy. 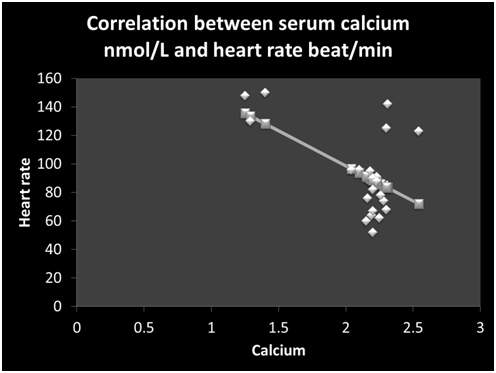 Linear regression studies showed that serum calcium was correlated negatively with heart rate (r =-0.55, p = 0.007) (Figure 1) and LVEDDSDS (Figure 2). 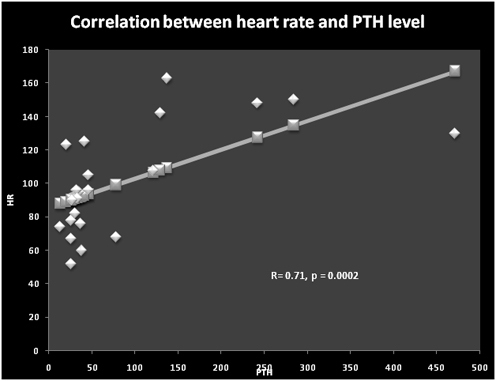 Serum PTH levels were correlated significantly with the heart rate (r = 0.71, p = 0.0002) (Figure 3) and diastolic blood pressure (r =0.65, p = 0.001). Serum levels of PTH and 25OHD levels did not correlate significantly with LVDDSDS or with FS. After treatment with a mega-dose of vitamin D, our VDD patients showed marked decrease in heart rate , LVEDD and LVEDSDS which was associated with increasing serum 25OHD and calcium concentrations and reduction of PTH levels. These data advocated an important role of vitamin D in directing myocardial function. There is broad evidence that vitamin D influences the cardiovascular system at many sites and has a role in cardiac function in humans and rodents [18-21]. Cardiac muscle cells possess a vitamin D receptor and a calcitriol-dependent calcium-binding protein [22,23]. Also, a calcitriol-mediated rapid activation of voltage-dependent calcium channels exists in cardiomyocytes . Epidemiologic evidence shows that vitamin D deficiency is associated with congestive heart failure (CHF) in dilated cardiomyopathy (DCM), coronary disease, and hypertension in people [25-27]. The vitamin D receptor knockout mice develop typical signs of CHF, such as cardiac hypertrophy, hypertension, and increased concentrations of atrial natriuretic peptide . Moreover, in animals calcitriol administration can normalize the impaired contractility of the myocardium that is observed in experimental vitamin D deficiency. These cardiac effects can be mediated by a direct effect of vitamin D on the myocardium and/or indirect effect through improving calcium absorption and increasing serum calcium [28-30]. In our patients, the significant correlation between serum calcium levels and the heart rate as well as the LVEDD proposed an important effect of increasing extracellular calcium ion that could modify the strength of the myocardial contraction through excitation-contraction coupling . Calcium is the major determinant of myocardial contractility. Calcium is essential to activate the contractile proteins of the cardiac muscle (contraction) as well as relaxation. Cardiac cells contain an extensive network of T tubules that extend longitudinally along myocardial fibers. These carry action potentials deep into the cell, where they open dihydropyridine (DHP) calcium channels that are coupled to ryanodine-sensitive calcium-release channels in the sarcoplasmic reticulum (SR). In the cardiac muscle, intracellular Ca+ levels and force generation can be altered in individual myocardial cells by normal physiologic as well as abnormal conditions . In support, Jahn et al showed that an acute infusion of 1,25OH 2D3 enhances the contractile state of the dog myocardium WITHIN 30-60 MINUTES. The improvement in contractile force was mimicked by a calcium ionophore and blocked by a calcium antagonist, suggesting a direct activiation of sarcolemmal calcium channels . Another possible mechanism of cardiac dysfunction during VDD is through secondary hyperparathyroidism. Studies have indicated an association between high PTH and heart disease. Patients with hyperparathyroidism have increased prevalence of cardiac structural abnormalities such as left ventricular hypertrophy (LVH) and valvular and myocardial calcification . In our patients the significant correlation between PTH level on the one hand and heart rate and LVEDD on the other hand and the decrease of both heart rate and EDLVD associated with the decrease of PTH after vitamin D therapy suggested an important effect of PTH on the cardiac function during VDD. PTH stimulates the vascular smooth muscle cell by binding to the PTH/PTH related Peptide (PTHrP) receptor and, thus, increases the intracellular cAMP-levels and reduces the influx of calcium. This is believed to explain the vaso-dilating properties of PTH, found in vitro as well as in vivo. PTH acts on cardiomyocytes by binding to the PTH/PTHrP receptor, thereby inducing a rise in the intracellular levels of calcium. Increased calcium levels activate protein kinase C and mediate hypertrophic as well as metabolic effects on the cardiomyocyte [33-36]. Moreover, VDD is associated with decreased insulin-like growth factor-I (IGF-I) secretion in children and adolescents [6,7,37]. An interesting relationship between IGF-I action and cardiac function has been noted and multiple actions of IGF-I has been described in cardiac muscle cells, including the well-documented anti-apoptosis effect and the newly emerged action on cardiac muscle regeneration . Therefore, a decrease in IGF-I secretion in patients with severe VDD may represent another mechanism explaining the accompanying myocardial dysfunction . In conclusion, these data indicate a negative effect of prolonged VDD on the cardiac function that is reversed by vitamin D therapy. This effect may be due to a direct effect of VDD on the myocardium and/or an indirect effect mediated by low extracellular calcium and/or high PTH and/or decreased IGF-I. It appears that maintenance of an optimal vitamin D status may be a promising approach for the prevention of myocardial dysfunction in countries with high prevalence of VDD. El-Hajj GF (2009) Vitamin D Deficiency in the Middle East and its Health Consequences for Children and Adults. Clinic Rev Bone Miner Metab 7: 77–93. Soliman A, De Sanctis V, Adel A, El Awwa A, Bedair S (2012) Clinical, biochemical and radiological manifestations of severe vitamin d deficiency in adolescents versus children: response to therapy. Georgian Med News 210: 58-64. Aggarwal N, Reis JP, Michos ED (2010) Vitamin D deficiency and its implications on cardiovascular disease. Curr Cardio Risk Rep 4: 68-75. Laguardia SP, Dockery BK, Bhattacharya SK, Nelson MD, Carbone LD, et al. (2006) Secondary hyperparathyroidism and hypovitaminosis D in African-Americans with decompensated heart failure. Am J Med Sci 332: 112-118. Zia AA, Komolafe BO, Moten M, Ahokas RA, McGee JE, et al. (2011) Supplemental vitamin D and calcium in the management of African Americans with heart failure having hypovitaminosis D. Am J Med Sci 341: 113-118. Ameri P, Canepa M, Milaneschi Y (2012) Relationship between vitamin D status and left ventricular geometry in a healthy population: Results from the Baltimore longitudinal study of aging. J Intern Med 253–262. Pilz S, Marz W, Wellnitz B (2008) Association of vitamin D deficiency with heart failure and sudden cardiac death in a large cross-sectional study of patients referred for coronary angiography. J Clin Endocrinol Metab 93: 3927–3935. Xiang W, Kong J, Chen S (2005) Cardiac hypertrophy in vitamin D receptor knockout mice: Role of the systemic and cardiac renin-angiotensin systems. Am J Physiol Endocrinol Metab 288: E125–E132. Hochhauser E, Barak J, Kushnir T (1989) Mechanical, biochemical, and structural effects of vitamin D deficiency on the chick heart. Angiology 40: 300–308. Soliman AT, Al Khalaf F, Alhemaidi N, Al Ali M, Al Zyoud M, et al. (2008) Linear growth in relation to the circulating concentrations of insulin-like growth factor I, parathyroid hormone, and 25-hydroxy vitamin D in children with nutritional rickets before and after treatment: endocrine adaptation to vitamin D deficiency. Metabolism 57: 95-102. ©2014 Ashraf T Soliman. This is an open-access article distributed under the terms of the Creative Commons Attribution License, which permits unrestricted use, distribution, and reproduction in any medium, provided the original author and source are credited. Professor, Division of Pediarics and Endocrinology, Hamad Medical Centre, Doha, Qatar.